Paradigm announces revamped Cinema speaker range | What Hi-Fi? 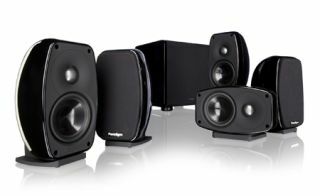 Now available from UK distributor Anthem AV Solutions is the new Cinema speaker range from Canadian company Paradigm. The new models have been completely redesigned and re-engineered, with technology derived from Paradigm's Reference models and entirely new cabinets. Prices start from £299 for a stereo pair of Cinema 100 Satellites, there's a £499 soundbar, the Cinema Trio, and a complete Cinema 100 CT package of five speakers and a subwoofer sells for £949. The speakers use S-PAL satin-anodised aluminium dome tweeters with wire mesh guards and the Reference Signature series WaveGuide Technology, and mineral-filled polypropylene mid/bass drivers, linked together with crossovers built to the same quality as those in the Reference models. The curved cabinets have a high-gloss finish, and feature the company's Easy-Glide wire channels and push-through binding posts for neat cabling, along with EasyMount wall-mounts. Meanwhile the new Cinema Sub uses a 20cm polymer-composite high-excursion driver and a 100W amp capable of 300W peaks for increased dynamic range. The design allows the sub to be used with either its cloth grille or the gloss panel uppermost, to suit individual tastes and decors. The complete range comprises the Cinema 100 Satellites, supplied complete with wall mounts and table-top stands, either in that £299 pair or at £429 for three, the three-driver/two-way Cinema 200 LCR at £199 each or the five-driver/two-and-a-half-way Cinema 400 LCR at £349 apiece. The Cinema Sub is £349 and the Cinema Trio Soundbar – with seven drivers, three channels and a two-way design – is £499.